For years I have been discussing collaborating on a book with writer and video game enthusiast RAINA LEE. Recently she moved to Los Angeles and now nothing can stop us. Our first venture out together was to photograph and interview some of the cast from the documentary KING OF KONG As Raina had worked with them before, not only did I meet a bunch of the competitive classic gamers, I got to hang out with them for entire evening and get to know them on a personal basis. Unfortunately that night Steve Wiebe attempted to take back the Donkey Kong crown, but it was too much of a media spectacle.As soon as he sat down to play he was surrounded by photographers, including myself, blinding him with flashes. I then heard him tell Walter Day in a very relaxed tone, "it's kinda weird playing with no sound." The situation was not ideal to beat Billy Mitchell's 1,050,200 high score. The game also crashed twice as he well deep, nearly an hour, into the game. He wasn't fazed by it at all, which was telling of his super pleasant disposition. 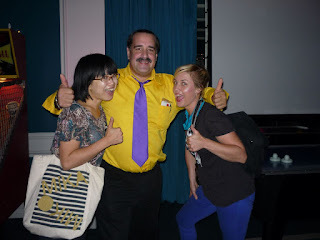 Raina and I give thumbs up to Todd Rogers who holds 2000+ world record high-scores and is certified by the Guinness Book of World Records for the world record on the arcade game GORF. Which is an acronym for "Galactic Orbiting Robot Force". 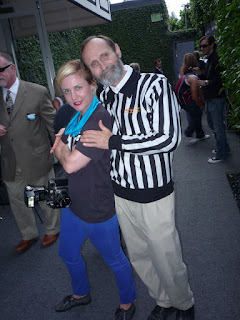 The lovely visionary, Walter Day, founder of TWIN GALAXIESthe world authority on player rankings, gaming statistics and championship tournaments, for pinball and video game statistics. All high score attempts are video taped to make them official. Tonights camera operator was Todd Rogers, who took the job very seriously. If you haven;t seen the film, here's a clip. I took a month off, saw 15 movies in the theatre (none of them current releases), and got in some pool side leisure. Without getting too comfortable, I'm onto the next big project. This time starring Leslie Hall in her debut role as the world's greatest in love with love teenager, Tammy Pierce, in "Unlovable" based on the comic by Esther Pearl Watson. For the next few months we'll be working side by side to make Esther's vision come to life. 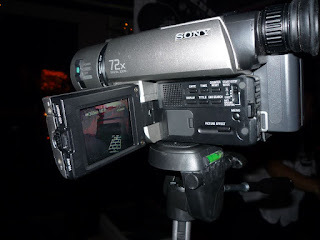 This will be Telefantasy Studios first non-science fantasy production, but not to worry it will be magical nonetheless.